I've been here now 3 times. EACH time I have ordered a different item. I also refuse to pay $4.95 for iced tea or give them any money for their overpriced drinks. In fact, I refuse to go there EVER now. That means NO money of mine will enter one of their cash registers from this point forward. Quite frankly, neither should yours! As cute as their logo is, the food is awful and has CONSISTENTLY given me an honest-to-God stomach ache after consuming their products. AVOID AVOID AVOID. Sorry, Pie Face. You're not welcome in my life anymore. 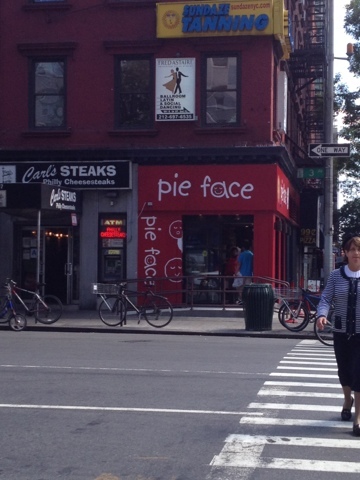 I entered Pie Face on 34th and 3rd with great hopes. There's been a lot of hype about this Australian chain hitting the Big Apple. I had a mixed sampling, as this seems like a cute bakery with great potential. I ordered a savory BBQ pulled pork pie, a mini pumpkin pie and a flour-less chocolate dessert. I also ordered a drink.